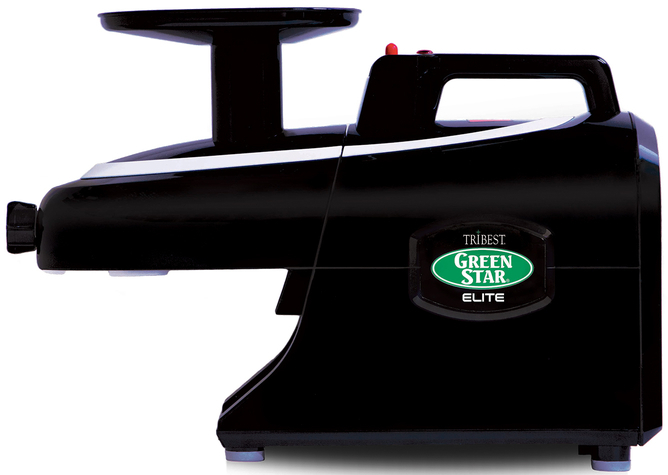 The only difference between Green Star elite Models - GSE-5000, GSE-5010 and GSE-5050 is the color. 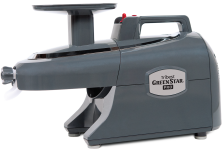 Hard to believe, but the Green Star Elite has an even higher juice yield than the Green Star GS-1000 or GS-3000! The Green Star Elite Juicer not only creates heavenly delicious and healthy freshly pressed juice, but the design also meets the aesthetic demands of modern households. No more knobs! You simply fasten the twin gear housing using a latch. This simplifies the cleaning! To enable you to prepare a variety of delicacies right away. And because cleanliness is an important topic, a drip tray is included  to keep drips from falling onto your countertop. 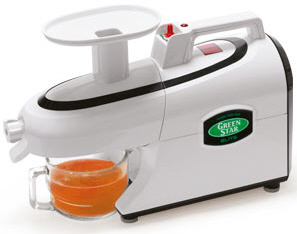 By juicing with powerful but slowly turning precision twin gears, there is only minimal heat generation in the juice, thus delaying oxidation. 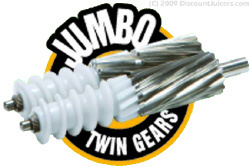 With only 110 RPMs, the conical twin gears turn into one another like gear wheels and gently extract the healthiest juices. The highly sensitive enzymes and valuable vitamins are preserved in the juice during this process. stainless steel area, the produce passes through the first half of the acetal screw and the produce is mixed and rubbed together so the cell membranes can be easily opened. 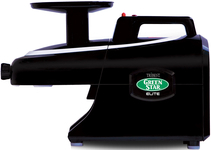 This is a revolutionary process only available with the Green Star Elite's Jumbo Twin Gears. DiscountJuicers.com is an Authorized Dealer for all Tribest products. Tribest products purchased from an authorized retailer includes FULL warranty protection (12 Years on the Greenstar Elite). Purchases from a non-authorized retailer may NOT be eligible for warranty protection. Be sure to purchase from a known Authorized Retailer to ensure your warranty protection benefit. What's the difference between the Green Star Elite and Green Star Pro Models? More minerals in optimal bioavailability! Bio-magnets have been integrated into the Green Star Elite Juicers conical twin gears to optimise the juice quality. They "pull" more minerals into the juice while increasing the minerals bioavailability. This means that your body can more effectively absorb and utilise the dissolved minerals. Not only juicing, but also homogenising fresh or frozen fruit (sorbets) is extremely simple with your Green Star Elite Juicer. All Green Star Elite components such as the twin gear housing and outlet casing are now lighter in weight than its predecessors. The GSE's juicing parts are also now made heat resistant and can now be used in dishwashers! Cleaning up the Green Star Elite is now much easier due to the 'latch system' which makes cleaning and assembly quick and simple. Using the GSE is now even safer because of the 'safety switch system' which disables operation unless the machine is fully assembled. The result is the elimination of chances to touch the moving parts. The top cover of the GSE must be removed to gain access to the moving parts and once lifted, the machine automatically shuts off! Using different plug types has been simplified in the GSE due to its new detachable power cord. SUPER HD Gears- 1 inch longer than the standard HD gears on the Green Star Juicer. Please note: Pasta Making Attachment($100) and Fruit Attachment are optional accessories.